Lac jewellery, or lacquer jewellery, is a much sought-after option as far as bridal fashion is concerned. This jewellery type is known for its versatility as it can be crafted into various shapes and colours. 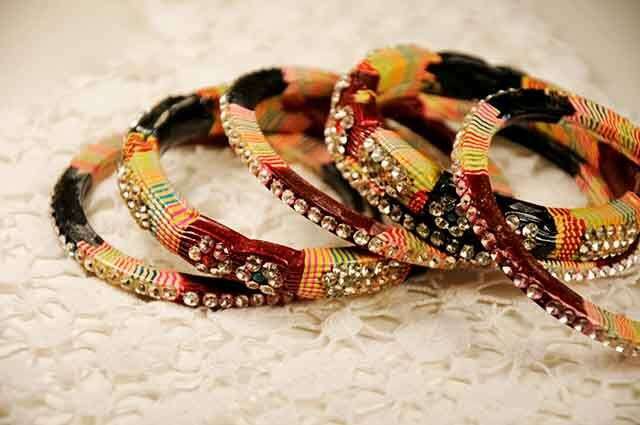 Lac bangles are particularly popular. What’s more, it’s supposed to bring good luck and hence, traditionally, there has always been a great demand for this type of jewellery. The vibrant colours of lac make it a popular choice for modern women as well. Making lac jewellery is a complex process. The jewellery pieces contain an inner core that is covered by a thin layer of top quality lacquer. When a material like white clay is added to the core lacquer, it strengthens the jewellery pieces. Heating the lacquer, mixing it, kneading it, and hammering and pounding it is done repeatedly, making it into a dough-like mass. This mass is then shaped into preferred designs. A flat shaped tool is used to roll the jewellery across a flat surface to give it a proper thickness. It is shaped by suppressing the lacquer length into coloured grooves on every side of the mould. The process requires high precision. Mirrors, glass beads and decorative wires are used to embellish lac jewellery. The latter are engraved into the jewellery while shaping the items and before these cool down. Lac jewellery is commonly found in Rajasthan, Gujarat, Odisha, Bihar and West Bengal. Rajasthan is known for its lac neckpieces and earrings while lacquered bracelets are common in Gujarat. The Bihar lac jewellery industry is also huge. Odisha, on the other hand, is known for making lacquered combs and boxes. In West Bengal, lac is used for making ornaments, bangles and décor pieces.